Which tool are you using to track your investment portfolio, in real-time and free? Actually, there are quite a few web tools that let you create and track your investments for free. For example, you can create a portfolio tracker using Yahoo or Google Finance and from there, you can either manually enter transactions yourself or import data to the portfolio and get updates such as market value, gains, and return in real time. Or if you own software tools like Quicken (now Mint for its online version), then you have a very nice tool that allows you to see all the statistics of your investments, not limited to each individual stock or mutual fund you own, but the overall performance of the portfolio as a whole. While these tools are quite helpful, they also have shortcomings from my experience. For instance, with Google Finance, I need to use the website if I want to check a particular transaction. On my phone, I can only see symbols, current prices, and changes, no more. Google Finance Portfolio can show today’s total of my portfolio. But if I want to see how much I had yesterday or a month ago, then I am out of luck unless I had checked the market value on that particular day and recorded the number somewhere. For Quicken, I don’t how to worry about recording the number myself, but all of its powerful functions are tied to that piece of software that is running on my home computer. Away from that computer, I have no access to the data at all. Of course, I could also log into each brokerage account and check how my stocks are doing, either through the broker’s website or mobile app such as the one from Scottrade, but that will require a fair amount of work since my investments are with multiple brokers. So it would be nice to have a central place to host all the data and, at the same time, also gives me real-time updates while allowing me access anywhere for free. If you know such a place or tool, please let me know. But for now, I am just going to use my own real-time stock portfolio tracker that I created a while ago, but updated recently, using Google Doc (now Google Drive). The tool is rather simple, but it gives me all the basic functions I have asked for so far. 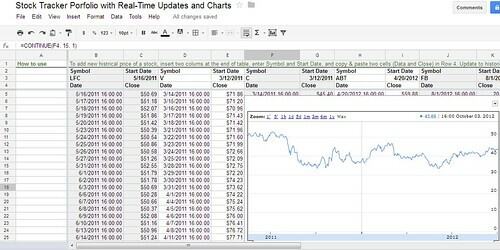 I created the original spreadsheet a few years ago, but didn’t use it that much because at that time, the only way to use it was through Google website. Not very convenient. And it didn’t do much other than tracking price changes in real-time. Now since I have the ability to access the spreadsheet on my phone, I am using it more and more, so I made some changes to make it more useful. Right now there are four sheets with different information. The first one is called Portfolio Tracker. That’s the place where I keep all transactions, both buy and sell, that include real-time updates of three major indices (the Dow, S&P 500, and NASDAQ), as well as all stocks I own. It will show me current prices and changes, and Daily Change, Market Value, and gain or loss of each transaction and overall return in both dollar amount and percentage. Updates are automatic after a transaction is entered with the right information about symbol, buy, or sell, date, price and shares. The second sheet is what I called Historical Price, where I display historical prices of all the stocks I own from the time of purchase, or any give day in the past. With the historical prices, I can draw charts of each stock with different time scale. I am thinking of using the historical data to update past daily value for the next sheet, but wasn’t successful. Updates on this sheet are also automatic. The next sheet, Daily Total Tracker, is probably the most helpful one of this tool because it allows me to track daily market total of the portfolio. As I mentioned above, free tools such as Google Finance shows me the portfolio total of the current day, but if I want to see how much I had a week ago, then I have to use something else, like Quicken, which keeps a record of the history. With the Daily Total Tracker, I can calculate the total market value of any day in the past and record the numbers in the table. Using the portfolio total history, I can then plot the change of my investments over time. The last sheet is actually a helper sheet that I use to calculate the past portfolio value. It’s basically a duplicate of the Portfolio Tracker sheet, but with less info. I am still thinking of ways to use Google Finance for the calculation. But given how the data is returned from Google Finance, the options are quite limited. If you are interested in trying this spreadsheet or using it as a template to create your own tracking tool, click here to request access. I plan to keep working on it to make it better. After using it, if you have any suggest to improve the tool, please do let me know. Sun, thanks for the example. Good place to start from. 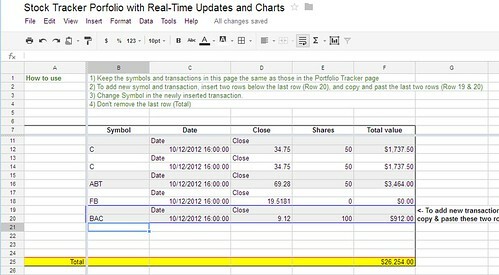 Do you have any idea if I can have the spreadsheet interact with the portfolio I’ve entered into Google Finance? I’d like to calculate my asset allocation based on ETFs I entered in Google Finance without having to keep a separate copy of my portfolio up to date in the spreadsheet also. Steve: It’s probably not that easy to figure out the asset allocation using Google Finance, especially for mutual funds and ETFs because you will need to know the exact allocation of each element in the fund to get the complete and correct allocation of the portfolio. I went through Google Finance functions and didn’t see such function is supported. Maybe there’s a way to do it, but I don’t know how to right now. Recently, I started to invest in stock market and choose two brokers. I invested my capital in 5 companies. I am investing in forex market as well. The main problem for me is, how to manage these all data from one place with live performance report. I am familiar with Only Mint but want to uses its alternative. I am interested to use your spreadsheet.